Outdoor physical activities are known to extend beyond play and fun as many studies have shown how it positively shapes the physical, psychological and emotional well-being of a child. Play is a pivotal part of a child’s life and outdoor play in today’s society is even more crucial as it provides a physical ‘playscape’ diversity – one away and different from the indoor environment, regardless of it being natural or constructed. Outdoor play nurtures a growing child by providing opportunities for holistic learning and development; combining outdoor, adventure and environment education. We speak with experts, Dr David Chan (Senior Consultant Ophthalmologist & Medical Director, Atlas Eye Specialist), Mr B. Elamaaran (Director (Training and Operations), Outward Bound Singapore) and Dr Lim Boon Leng (Psychiatrist, Gleneagles Medical Centre) to share reasons why it is time to get your children out of the indoor malls to the outdoor playscape! Enhances Social Skills For children, even at an infant stage, playing is the main way of which they learn social interactions and other skills necessary for normal development. Outdoor activities are an important aspect of play. Outdoor activities allow for the possibility of playing in a large group and enhances the child’s social skills and ability to work in a team. Ability to work and to get along with others is a crucial predictor or success in the future. Playing together also enhances the relationships of the family. Increases sense of well-being Outdoor activities also helps by allowing the child to use the whole of his body during play and this trains coordination, balance and spatial sense. Acquiring these skills and becoming physically stronger and healthier from sports and outdoor activities help a child feel more confident and increases his overall sense of wellbeing. Getting adequate sunshine outdoors is beneficial for psychological health too as it helps to regulate the circadian rhythm of our body and allows for better sleep at night and wakefulness in the day. Sunshine is also a natural antidepressant and brings about a positive mind-set. Builds healthier body Outdoor activities encourage physical wellness as sunlight helps with the production of Vitamin D, crucial in for the building of strong bones and teeth and a deficiency in it can lower bone density and increase risk of osteoporosis as without it, the body cannot effectively absorb calcium. In addition, when your child runs, skips and play in the outdoors, you are strengthening his overall muscular tone, strength development, mobility, flexibility and immune system. Enhances eye health Many have yet to realise is that the hours spent in the outdoors have a direct correlation to reducing the risk of a child developing myopia or short sightedness. Dr David Chan shares, “Research has shown that the risk of a child developing myopia, or the eventual severity of myopia, can be mitigated by increasing the amount of time spent outdoors. The reverse is true, in that the risk of myopia increases with the amount of time spent focusing on objects up close and these include handheld personal computer devices and books”. Increases appreciation Spending time in outdoor spaces can help the child learn more about the symbiotic relationship nature has with man (man with others), this is important especially in concrete garden Singapore. 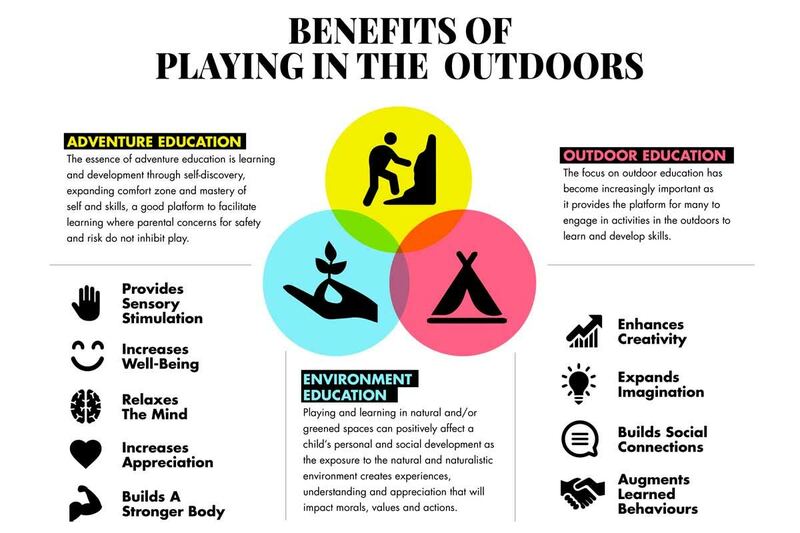 The outdoors also introduces the child to new modes of recreation, and present more opportunities to promote active and healthy outdoor lifestyles. As they explore Singapore through various outdoor activities on land, sea and our waterways, they will be exposed to various interesting outdoor spaces within Singapore, build memories of the places and develop a greater affinity for Singapore. This will also gain a deeper appreciation for how Singapore has creatively used our land and water resources. A version of this article appeared in the print edition of Singapore’s Child March Issue 173 with the headline ‘The Great Outdoors’ with expert advice from Dr David Chan, Senior Consultant Ophthalmologist & Medical Director, Atlas Eye Specialist and Mr B.Elamaaran, Director (Training & Operations), Outward Bound Singapore. Share with us your favourite outdoor activity below or send in your family outdoor activity photos, ideas or tips to [email protected] for a chance to be featured in our magazine.